Reader Question – How do you feel about the size of your home? “We are closing on our house this Friday, it is 1523 sq ft. When I told friends and family, a lot of them think it is a little small. I would love to see a blog post on your thoughts on house size”. I think that is an excellent topic for a post, so lets dive right in. The average size of a house in the U.S. nearly 2400 square feet (source), my house is 1650. Adam and I purchased it back in 2010 (our first house!) and we planned on it being a starter home. We would live in it for five or six years, pay it off, fix it up, sell it, and move onto our next adventure. So far everything is going as planned, and along the way we have learned a ton. Not just about DIY stuff, but about the way we live, the way we work as a family, the things we love about our home, and the things we would change. One thing I have learned along the way is that I don’t ever want a giant house. 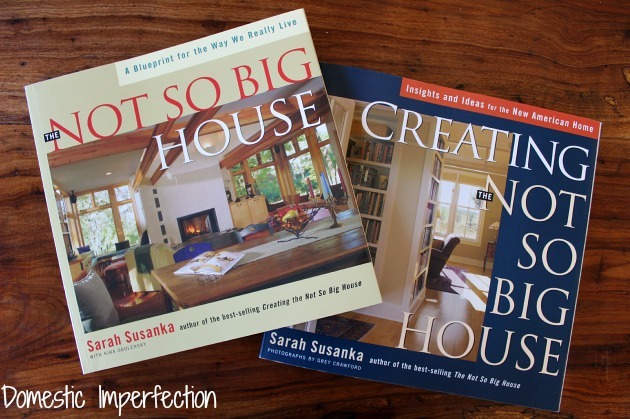 Have y’all ever read The Not So Big House books by Sarah Susanka? 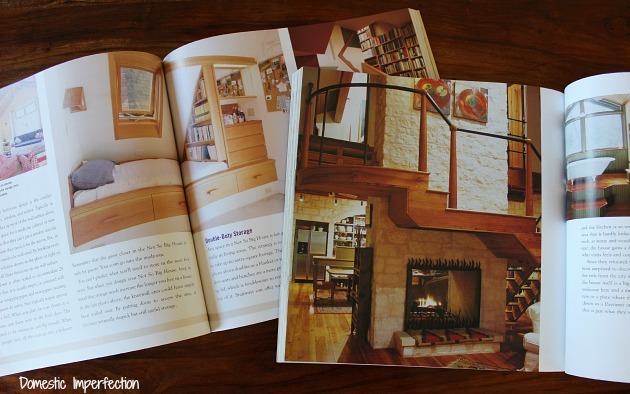 I’ve owned these books for a really long time….long long before owning a house was feasible. Sarah is an architect who designs homes that use every square inch of the space. Not like those teeny homes that people build on utility trailers these days (although I do love those), but very reasonable homes that are functional and beautiful. This concept has always resonated with me, probably because the homes in her book are very high quality, personal and, well, practical. In our house we have one dining area, it’s basically an eat-in kitchen with a large table. We use the stew out of that thing. Not only do we use it for eating, it is also where I paint and work on projects. It’s where my kids do art and crafts and other kid things, we throw blankets over it and make forts and caves. My boys run around it like a race track …playing tag, riding bikes (for real), and dragging each other around on blankets. Whenever a holiday rolls around we host our (very large) family and pull up extra chairs, or ice chests, or whatever is around. We’re a casual kind of family and it works for us. Same principle goes for our living area. We have one living area that serves all our purposes. If I had a living room, den, and playroom they would either 1) never get used or 2) be giant messes all the time. I’m not okay with either one. Every square inch of our house is used (and abused, it’s NEVER as clean as in these pictures) but I’ve never really felt cramped. There are some downsides to living in a smaller home. (I feel completely weird called 1650 square feet a smaller home, btw. Our first apartment was 350 sq ft.). The main downside is that there isn’t a place to escape from the kids. I can’t retreat upstairs or into my office, everything is right there and basically fair game. There is no hiding. Even after hours (aka post bedtime) Adam and I can’t fully escape. When watching our usual nighttime TV we always have the remote in hand to turn it down when we anticipate loud parts. Need ice in your drink? Forgettaboutit, that ice dispenser might as well be a jackhammer. I never wanted to be that parent that catered to a their kid all the time…but then I became a parent. That special time when your kids are asleep and you aren’t is SACRED. So living in a smaller house does have its downfalls. Also, the master bathroom is tiny. At one point it is 23 inches across…it’s a good thing we’re small people. Honestly, the next house will most likely be bigger than this one. Our price range is going up (land, porches, and barns don’t come cheap), and if the average house is 2400 sq ft then most things on the market are bigger than our current home. Plus we are hoping to expand our family, and with that comes the need for an extra bedroom (unless that room above the garage actually happens). I would think that even with the addition of a fourth bedroom I wouldn’t want/need a house over the average 2400 square feet. As Adam likes to say, smaller homes “keep the love in”, haha. The main focus isn’t really the square footage though, it’s the fact that I want to live well within my means. I want something where I can easily afford the electric bill and the taxes. I want something I can clean and maintain without hiring a slew of help. Because lets face it, in most cases a bigger home means bigger bills, and bigger bills mean working longer and harder at your job, which means time away from family and the things you love. I’d love to hear how y’all feel about your home’s square footage. Perhaps large houses are amazing and I’ve just never known because I’ve never lived in one. 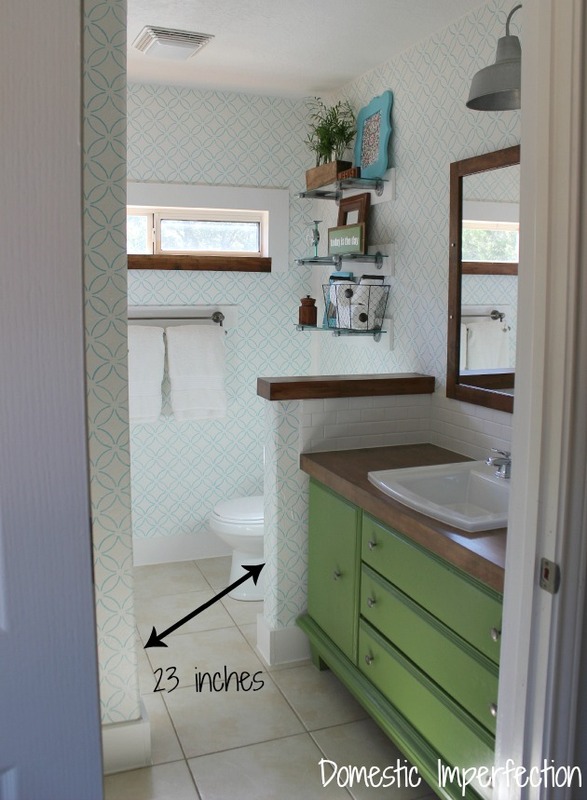 So let’s hear it…how many square feet is your home? Do you wish you had more space? Less? What would you change in your current (or next) home? Discuss. Our house is 1100 square feet, which is small by today’s standards. But we love it! It is layed really well, the rooms are comfortable and big bonus, its easy to clean! We will probably add on in the future but we are very comfortable now. In our case small works perfect! Our home is just over 2200 sq ft, and I find that too small. I would love to have another 1000 or so ft… we have four beds, four baths. Two adults, and two boys nearly the same age as yours. Ideally I would love another two rooms- one as an office, another as a second guest room + its own bathroom. And maybe a den (for reading, relaxing- our actual den turned into a play room, the living room is like a man cave). I know that sounds horribly picky, but its all due to many factors- we live in a suburban neighborhood where yards are small, and its in the northern part of the country so we currently are buried under snow and spend a ton of time indoors! Plus, we live in a different state than all of our family, so when they come to visit we need room to put them up for a night or two, comfortably. You must live by me…this sounds very familiar. If we still lived in upstate NY and had kids then indoor space would be much more important. Like a giant basement turned into a jungle gym or something… not being able to kick your kids outside to run off extra energy would be difficult! My little cape is around 750 sq. ft. It’s a tiny little house but it’s just me (and my cat!) living here so it’s ok. The biggest issue that I have with this house is the kitchen. Besides being fugly (just for you, Ashley! ), it’s small and hardly functional. I like to cook, but until last week there was LITERALLY 6 inches of counter space to use (between the sink & stove). There’s not a lot of storage space either. There is one long (short) wall of cabinets and that’s where the sink and stove both are. There was a microwave and tv on the only actual counter space so I finally moved the microwave to a spot on top of my trash can holder (it’s an old jelly cabinet that I removed the shelf from to put the trash can inside it, still has one small shelf on top that I keep swiffer pads and random stuff on, but I had to take the door off of it because the stove wouldn’t open with it on there, so now I just have a piece of fabric over it as a curtain, I like it though!) however the microwave is GINORMOUS and doesn’t fit, hangs off the sides and front. It works, but it’s annoying. But at least now I have a little bit of usable counter space. There’s also not room for a dishwasher so I’ve been doing dishes by hand for going on 13 years now. Nextly, the stove is older than time (as I’ve mentioned in previous comments – the house used to be my grandparents’ and I’m pretty sure the stove is from the 60’s) and only 3 burners work, and two of them you have to manually light if you want to use them. And the stove door doesn’t stay completely closed, so if/when I want to bake it takes FOREVER for it to heat up, and then I have to wedge something against it to keep it completely closed. I recently found that a pack of wood shims (irony!) fits perfect between the stove door and the trash can cabinet, haha. SO! In my next house I require much more storage in the kitchen as well as counter space, a dishwasher and a functional stove (and maybe a smaller microwave, ha!). And maybe a master closet. I dream about having enough room to hang up all my clothes instead of leaving them in laundry baskets and going through them to find stuff. And I’m so with you, I’d love a ton of land!! My backyard is a decent size but the ground is very uneven, there are ridiculously huge bushes that are along the fence separating my neighbors backyard and the grass is horrible – some weird kind of grass that is crabgrass until it gets really hot out then it grows like weeds. No patio and no direct access to it (have to go out the side door and around to it). Would love to have a nice big deck and/or patio space for some furniture and a fire pit. And less bugs, haha! I feel you on the kitchen space…our second apartment in NY didn’t really even have a kitchen, it just had appliances. My dining room table become my kitchen workspace. Closets and useable outdoor space is important too…though I might just give up both of those things if I never saw a mosquito again! I lived in a 650sqft house for 3 years I always wanted a bigger house but I rented and new I would never be ablet o afford to own my own home (I am 46 yrs old and have always rented) the house was nice and it really defined the word togetherness, Well I just a month ago bought my own home it fell right into my lap I wasn’t looking but here I am I am living in a 1459sqft home my living room is humungous as big as my other house combined. I really love it I have a attached garage where I can refurbish all the furniture I want instead of in my tiny lving roo where I used to do it. I would never want a bigger house I have RSD an thankfully this one is 1 1/2 stories my daughter lives upstairs I can not climb stairs with my disorder, no more going to the basement to do laundry. So I will sat I love my 1459 sqft home it is just the right size. Congrats on your new home, it sounds perfect for you! Our house now is 1380sqft and, Adam is right, it does keep the love in. We downsized from a 2600sqft condo when we came here, and that was quite the adjustment. We went from literally being able to have a playset in the basement and run laps on the upper level to stacking kids and converting closets into beds and sewing corners. I do find that I prefer the smaller house and while I’m perfectly happy here now, I certainly wouldn’t turn up my nose at an extra room or perhaps a customized floor plan for what we actually need out of a house. Actually, I take that back. I’d give my left arm for a screened in patio/sunroom tacked on to this house. But that’s it. Until we have more kids, and run out of closets to convert. The land does make a huge difference, too. The huge condo from before had only a 20×30 patio, so when we ended up with a whopping third of an acre here, it felt like a million acres. I do long for something in the 5-10 range though. I remember following along on your blog as you downsized and was really impressed with how well you did it… thats a big change. I’ve always thought your house was adorable. I missed the posts about converting closets into beds, do you have a link? (I saw the dress up room though). We have plans to start converting closets into more useful spaces…the guest/craft/work room closet is turning into an office and the entry closet is becoming a “mudroom” (eventually). You must have some big closets! I wish! The closet I want to convert into a mudroom is about 2X3 feet, and want I want to turn into a office is about 2X6….just enough for a built in desktop, drawers, and wall storage. I need to write that post up (soon! soon! ), but I always look around the room and find just one more thing that isn’t finished. It’s been nearly a year, I should get on it! I completely understand where you are coming from! My home is a little over 1500 sq feet with a half an acre. It’s me, my husband, and my dog. I can’t imagine having any more house with just the 3 of us. Especially with us both having full-time jobs. If the house was any bigger, I would need a maid. If we have more than one kid though, we will definitely need more space! I’ll be honest: I love having a big house. Our old house was just under 1900 square feet, which felt plenty big when we moved in (with one toddler and a baby on the way) but was starting to feel cramped when we moved out. We have just under 2900 now, and, I feel a little sheepish about saying so, because I know no one NEEDS this much space, but I really, really love having the space to stretch out. We have 4 boys, though (the oldest is about to hit the teen years), and we homeschool, so we’re here a lot. I also feel like our new house doesn’t use space as efficiently as it could; less space would FEEL just as big in a house that used it better, I think (we have a lot of sf given over to hallways and things like ridiculously big bathrooms). I grew up in a 3600 sq foot house with 2 rooms and a massive walk-in closet just for me. When I turned 18, I packed up all my junk and bounced around from unnecessarily large apartment to apartment until my husband and I bought a 1550 sq foot town home when I turned 23. Having less space is an adjustment but also a good thing because I never realized how much of a pack rat I was. It has forced my husband and myself to be more organized and use our space better, which I feel is a really good thing. Having extra space just leads to extra unused clutter or empty rooms, both of which are just a waste of money. I live in Colorado, so the more unused space you have, the higher your heating/cooling bill is for no reason, not to mention the cost of the stuff filling all that unneeded space. That is one of the reasons I don’t want more space… because I will fill it with more stuff (that I don’t need). Adam and I have gotten fairly good at purging, but still… thats just what happens! We just built our second home and it is around 2800 square feet but half of that is an unfinished basement. We half there bedrooms and two bathrooms. For now, it’s perfect for me, my husband, and our two year old. Eventually we’ll have more kid(s) and finish the basement. It’ll be nice to eventually have a playroom, guest room, sewing room/office, and a place for my piano to live but for now I’m quite content with it. I would rather have land too. We don’t have acres, but for our area, our 1/3 acre is quite large and I’m excited to have a place for my family to enjoy being outside together. Also, I love Colorado. Adam and I have always said that if we couldn’t live in Texas we would live in Colorado or Tennessee. Are you still on this blog? I am also in Texas in. 2000 sq ft ranch with one tot. House is great but missing a playroom and yard. I hate to move and prices are so high. What are thoughts on toughing it out. I really don’t want to move. And schools are ok but the town over has the best schools and the prices are HIGH. My home (which I bought by myself fourteen years ago) is also 1650 square feet; four bedrooms, two baths on a modest city lot. I had three kids at home when we moved in and it was a little tight, but now it’s just my youngest daughter and me. When she leaves I will have more space than I really need and am considering renting a room or two to college students, to help save for my eventual retirement. I wish the closets were bigger but otherwise, I have no complaints. It’s a great house! My home is just right for me and my dog at 1368 sq feet. It has 3 bedrooms and one of them became my storage room. Having that storage room brings me a great deal of peace of mind. I have a guest room that never gets used as a guest room but does get used…and it is always ready just in case. I spend most of my time in the main area which consists of the living area, dining area and office area combined. I love it this way…open concept….spacious. I don’t need more living space but…I would like more project workspace…like a small building outside because I’ve got plenty of yard space for one. Past that, I’m pretty content with what I have. Could I go smaller…probably but prefer not. Could I go larger….maybe a bit but just for the sake of having more room for an occasional social event at my house…which isn’t much of a priority for me. I did enjoy what you shared and how living “small” and within your means for now have taught you about your needs and what you want in the future. I like finding ways to make better use of the space I have, to use it to its greatest benefit. Sometimes, the need for more space is really a need for better organization and downsizing. That last sentence is SO spot on. Whenever I start to feel cramped it just because the stuff is taking over and I need to simplify. Great question! My home is approximately 1630 square feet that is heated and I love it. With our garage, I think it totals around 2100. Both of my children are able to have their own room and they share a bathroom. Their bedrooms are not huge, but we didn’t want them to be. Honestly, it takes a lot for me to clean this size house. I can’t imagine having something a lot larger. We have had to gradually make adjustments to make storage space, but I have enjoyed the challenge. It has also made me realize how much “stuff” I have that I do not need. We turned our dining room into an office to make better use of the space. And, it has been an amazing change. Everyone is different when it comes to their expectations in a home. As long as you are happy and able to call your house a “home” you are a winner, no matter what the size may be. We have the same size house and it is a constant struggle to keep mine clean. I think it less about that space though and more that my kids are constantly moving everything around and being ridiculous mess makers. I’ve been working really hard to teach them to clean up after themselves, but at 3 and 2 they aren’t quite to that “helpful” stage yet. One day! Storage space is an issue in our house too, we don’t have a basement, useable attic space, or a garage (just a shed, basically). Sometimes I hate it, but most if the time I am grateful because it keeps me on my toes about the amount of stuff we accumulate. Our home is a ranch approx. 1180 Sq ft. It’s been great!!! No worries about our children (when they were young tots) falling down or climbing the stairs and I always knew where they were. I agree with your husband. I think the small house has kept us closer. We renovated part of our basement but my kiddos still like to be close to mom making dinner!! Love it!!! (most days;) But now that they are both out of diapers the one bathroom is a drag. So we’re looking a slightly bigger house with more land. Thanks for sharing!!! I enjoyed this post. I have those books and love them! We are in about 2,400 now after living in 800 sq ft for 10 years. It is an adjustment to go to a bigger space, but I love our house. We will add on a bit for an art studio but our house is big enough. Are there areas I wish were larger or different, yes. Overall though, I love how open our house feels and what we have with 4 bed and 3 baths. We just got lucky with this house and I thank my stars every day . Wow. Your house is beautiful and I think it’s just the right size (especially here in the Philippines were space is limited; or where real estate is a little too pricey for starting families like ours haha). The partner and I are hoping to get a big lot and build a house with just the right size to make it feel cozy – not too big that it becomes hard to see each other everyday. Your house is an inspiration. Thank you! I like what you said about a home being just the right size to be cozy, I think that is my ultimate goal in a home …big enough, but still cozy. Well…. this is timely for us. We’re moving because we want more space. We have 1700 now, and will be moving in four weeks (eep!) to a basement suite. We haven’t found our next house yet. I’m wanting it to be more. My family lives out of town; I want a good spare room for them to stay and be comfortable. I also want – NEED – a garage. Acreage is worth a mint here. So while I would love love LOVE to have land, it’s beyond my scope. Think – a million dollars. So I will have to find a house that I love with a little bit of space to stretch out in. But a 350 sq ft apartment? What!?!? I’m going to check that post out ASAP. Haha, I had a serious love/hate relationship with that apartment. I mostly loved the price…$350 a month INCLUDING utilities ( and that was in upstate NY, where heating is $$$). It’s because we lived there for three years that we could afford our current house. I”m excited to keep up with your house hunt, I’m sure you will find something amazing (with a garage!). So most of our married life we lived in tiny apartments (about 400 sqf) on Oahu and that was ok. We knew a house was in our future and we, like you, wanted a few acres, a barn/shop and a bigger house. Other things we wanted were a basement, a fireplace, decent size kitchen and a well. Lucky us, we found just that with in our budget….just not in Hawaii….lol. So we gave up the tropics for something we could call our own and, like you mentioned, have the time to clean and afford to maintain. 1024. That’s how many square feet we have. We’ve made the best out of it. It’s our starter home that we’ve been stuck in due to the economy. God knew we weren’t moving and he blessed us with two girls to share the only other bedroom, then he went and blessed us with a baby boy who is going to get shoehorned into his sisters’ room when he’s ready for a crib. Our saving grace is an extra room on the back of the house. It is our office/craft room/homeschool room. Our house has a dining room that is too small to dine in; it’s more of a pass-through that we have converted to a play room. I am amazed at how we are making it work. I am a hoarder, my husband doesn’t like clutter, and there are five of us now with all of our stuff. In two bedrooms and one bath. I’ve been living with one foot out the door for five years, I’ve loathed this house; but lately I’ve come around to acceptance. This house is working for us, but I would love a little room to spread out. I would gladly choose a smaller home if it had a different layout and another bedroom; open-concept, so I am not so claustrophobic. 2000 square feet is a lot, however, I’ve been in many homes with that square footage that really don’t offer much. I think I will have to look out for those books you mentioned at the library! Thanks for the resource! We bought our house and it was 923 sq ft. We were able to finish part of the basement that added a small office for me and a den for my husband which added about 250 more sq ft. We have to be very mindful about what we have and how it can be stored. But I know with a bigger house that just means more stuff, more to clean and higher utility bills. 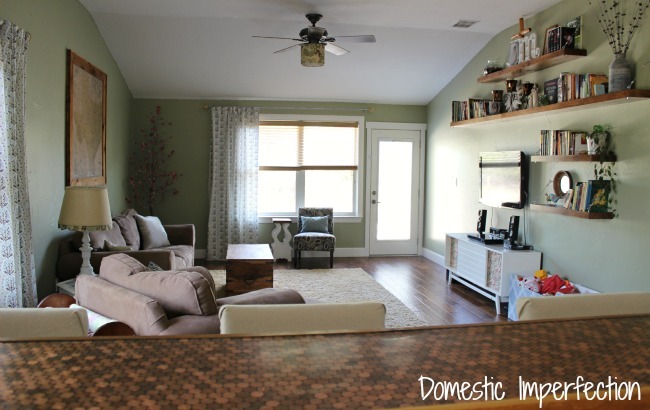 We have 2 children and sometimes it is a little tight when friends are over and I started painting furniture after we bought it so I would have loved a larger garage, but again, it would just mean more stuff that I just don’t need to waste money on. Did I mention we can afford the house very comfortably? I think that is most important. I love my little house! We have 1900 square feet in a 4 bedroom, 2.5 bath home. We also have a finished and unfinished basement. Some times I wish it was a little smaller because I think it would make me purge, but I think the big problem is that we just don’t have any good storage. There is one tiny closet in the entry way and an even smaller pantry in the kitchen and no other storage on the first floor. There is nowhere for the vacuum to live! We love having the extra bedroom which hubby also uses as an office and the basement has a pull out sofa. We need this since we have no family in town, so we have to have room for guests. Our girls are young now, so 4 of us in two small bathrooms (both smaller than your master!) isn’t a big deal right now. We’ll see how that changes when they’re teenagers! I live in an area where additional square footage comes at a high cost. Our 1450 sq ft home on a 6,000 sq ft plot of land costs us over $8,000 per year in taxes (including school taxes), so I’ve gotten accustomed to living with less. . Not to mention, having 2 (small) bathrooms for the first time has been a real eye opener. No matter the size of the bathroom, that’s still 2 toilets, 2 tubs, and 2 sinks to clean and this girl does not like cleaning bathrooms. I like to think I live in a home where thesquare footage is used wisely. We do have a formal dining room, but it doubles as an entry way and a pass-through to the other living areas, so it doesn’t get entirely ignored when not in use . I think the most important thing is not to live beyond your means and find a house that can best fit your lifestyle. If you love to clean and entertain, then maybe go for the additional sq footage. If you don’t, then what’s the point of stretching yourself to have all the space? Our house is 1600 sq. ft. and sits on 1/8 acre. Over all, I love our home! It’s an open concept with all of the shared space downstairs and the bedrooms upstairs. The bedrooms are each quite large, which was one of the main selling points for the house. However, the storage is horrible! We’ve gotten creative with adding shelves to the garage and utilize lots of under-the-bed storage bins! The biggest challenge with our house is actually the lots that it sits on. At 1/8 acre, it’s been a great starter home of sorts but our little Urban Farm is busting at the seams! We are definitely dreaming of a bigger property for more chickens and bees plus goats and so-much-more veggie gardening space! My husband and I bought our first house in 2007. It was around 1700 sq ft and on 3 acres of land. It felt a little big since it was just us two (along with our 2 dogs and 1 cat). We then moved to my hometown and “temporarily” lived in my mothers rent house. The rent house was approx 700 sq ft. We stayed there for 2 years and at the end of that time, 2 adults, 1 baby, 3 dogs, and 2 cats were shoved into that 700 sq ft. We were going insane. Last year we bought another home that is 1400 sq ft. It feels perfect. Through all this moving, I have learned to love a smaller home but to really love the space around it! When you only have 700 sq ft, you get out and do so much more. We have 1000 sq ft now and are putting on an addition and a second story, so in the end we’ll have around 2000 sq ft. Right now we have 2 bed and 1 bath, we have two teens, run two businesses and we homeschool. The new addition will give us 4 bed and 2 bath and enough space for offices and study space. When the kids are gone, we can close up the upstairs and use it as guest space only when we need it. [No need to run up and down the stairs or clean the upstairs any more than we have to]. We spent a lot of time reading the Not So Big House books while we were developing the plan. [Yes, there will be an Away room in a quiet corner of the new house.] I second your endorsement of those books. They’re fantastic. Great post! Our house is quite small, and I think I would prefer something bigger. We currently don’t have a basement, so that would be ideal! Our first house was a three bedroom one bath with 1500 square feet on a small town lot. Second house was 2500 square feet three bedroom two bath on 8 acers. That was too much for me. I didn’t enjoy paying more for everything, just to spend more time on upkeep. While I enjoyed the privacy of the land, it wasn’t worth it for me. So last year we sold it and moved our three boys back to a 1500 square feet three bed two bath house in town. I LOVE it. While we lost the square footage in the bedrooms, but we gained square footage in the living areas. We still can spread out and have our own space in only 1500 square feet. And it feels great using all the square footage we purchased! Our home is about 2600 sq. ft. (I think) and it’s a pretty good size I guess. My kids are grown, although one still lives at home. The house was built in the twenties and we remodeled it to suit us, so that’s a positive, although like many people, after having lived there for twelve years, there are some things I would change if I could. We have three levels which is great for added privacy – our master bedroom and bath are on the third floor and my daughter’s room is in the basement, for example, but three floors is tough to clean. When we retire in a few years, I think we’ll probably look for something on one level and a bit smaller. I think I’ll check out the books you mention! Our house is almost 5000 sq ft. At this point in our lives, it is the perfect size. We live in the Chicago area and with that comes a lot of time spent indoors. We have two teenagers who have friends over practically every weekend, and on any given occasion, we may have 10, 20, 30 + additional teens under our roof. Our parents live more than a 15 hour drive away and when they visit, it is usually a month long stay…they are able to feel completely at home in our finished basement, which has a bedroom, living area, and full bath. The basement area also houses all the teenagers we entertain and has space for game boards, movies, foosball, etc. Our neighborhood is big into entertaining and we regularly take turns hosting block parties. Our outdoor space is not excessive, but is adequate for our needs. It also makes for less maintenance which allows for more family adventures on the weekends. Our family is very active and we are on the go a LOT, so it’s very enjoyable to have space to spread out and relax when we are home. Once our kids are away from home we may look into other options, but for now the square footage is perfect and we use every inch. we have 1900 square feet finished, plus half the basement finished which we never use, plus an oversized two car garage with an unfinished space above (could be finished in the future, but for now it’s storage space). It’s just two of us for now but I can’t see running out of indoor space even with kids. I don’t understand why people think they “need” two living rooms, a playroom, etc. We have an eat in kitchen as well as a dining room which I find to be a waste of space. I will say having two stories will probably be nice, so kids could be upstairs sleeping and we could be downstairs in the living room or getting ice in the kitchen. I can’t imagine ever needing more space and I think people tend to live outside their means when it comes to their house. Your approach is very thoughtful and practical. The outside space you have is something you can’t typically expand, so I would focus on spending money there. My house is 2800 sq. feet. My previous house was about 1700. The plus to upsizing is that now we have room for family gathering such as birthday parties and holidays. Yes, we also have room to escape from the kids and have a little quiet time. The extra space is wonderful if you have musicians in your home. Our piano is at one end of the house and my husband can stay up and play when we eager head to bed early without being disturbed. We also have more outdoor space. We live on 5 acres which demands much of our free time. We love to spend time gardening, planting fruit trees, chopping wood and watching sunsets. The kids like living on the property for climbing trees, playing hide and seek, zip-lining and planting flowers. All that said, I love the house I live in and the abundance of storage it offers. My husband I hate clutter so the extra storage is a must! The Cons: cleaning 4 bathrooms is sometimes all I get done why the kids are at school. Bringing “stuff” into the house seems to be a bad habit for the girls because they have space and storage. We have to be purposeful about not keeping “stuff” if it remains unused. At this time in our life the space is wonderful, but I can see a day in the distant future when a smaller home would be less of a burden. We are true homebodies so the space at home both inside and out works for us! My house is right around 1200 sq ft with an additional 250sqft of garage space. It is perfect for me (me, BF, 2 cats and a dog)- 2 bedrooms, 2 bathrooms. It’s a little short on living room space (one big living/dining room) but other than that I honestly don’t think I would want any more space at this point in time. Boyohboyohboy!!! Am I the only person in Blog Reading Land that lives in a mobile home?? I have 1281 sq. ft.. Three bedrooms, 2 full baths, central air, dishwasher etc.etc.. I love my home. Just me and the (4!) cats now that my daughter is grown and moved. I’m very happy here. This is perfect for me. My house is about 1300 Sq feet and too small, The amount of rooms etc is acceptable, but the rooms (mainly the bedrooms, bathrooms and kitchen) are too small. Even though it is just me and my husband (crafting needs lots of space) I would like a master bed big enough for a sitting area and a master bath big enough for 2 sinks. And some day, when I grow up (I’m 51) I want a formal dining room that sits there just waiting for Thanksgiving. Enjoy you blog, keep it up. I love your honesty. Our last house was ~2100 SF and while there were some things I would change about it, it would be small tweaks. It was pretty close to being perfect. Our current house, wait for it, 5400 SF. Ridiculous. That was in no way a criteria (it was a downside in a lot of ways) but we are a five minute bike ride from my husband’s work and in a great neighborhood. If I find something that works better, I’m willing to move. (I have no yard. It’s 5400 SF on .15 acres. Crazy!) And here’s the worst part, there is all kinds of wasted space and my house is bigger than I need without even meeting my needs. No pantry, no mudroom, no laundry room. Anyway, no need to go on and on, but it’s just ridiculous. I love love love when houses are super efficient. Excited to look into that book! In theory a really large yard and big deck sound great. But unless you want the outside to be “natural” there is a ton of work to maintain that deck and yard. And expense. Riding mower, probably, weeding, fertilizer for lawn and trees and bushes, pruning, watering, plants you add….we also have fruit trees so there is lots of work there too. Yes, lovely lovely great tasting fruit you can’t get at the store, but….and as mentioned by others, property taxes can be very high. Our house is just a smidge under 1700 square foot but it is set up well and people always think it is larger. It also has a 3 car garage, large covered back porch and full unfinished basement the same size as the house. It has 9 and 10 foot ceilings throughout even in the basement so it doesn’t feel cramped. There are only 3 of us so it feels like plenty of space. Sometimes I would like a real dining room (we only have one space like you) and a large laundry room and an entry way, etc. But then I think about keeping all that clean and think “No Way!” I just cleaned out our closets and the basement and realized we keep way too much junk. If we par down we have plenty of space. I like using every room in our home too. This year I’m really focusing on organizing and using our space to the best for our needs. Great post! I currently live in an apartment which is right at 1,000 sq ft. I came out of a 4,000 sq ft house with a full unfinished basement (which means tons of storage), a 2 car garage, and a pool and spa in the backyard. I miss the backyard terribly – a private space outside – numerous sitting areas both in the sun and in the shade, floating in the pool and looking at that gorgeous blue sky. We had 5 bedrooms – one the master, one the guest, one a catch all, and the other two we used as office space. I miss my office space with the bookcases and large desk and big windows, the chandelier, and the privacy. I also miss the other get-away-spaces – we had a great room, a study with bookcases (perhaps my favorite room), an large upstairs living room, space in the master to have a chaise lounge and side table. What I like about my 1,000 sq ft apartment. I can clean in a couple of hours – top to bottom – completely done! Hell I can straighten up within 5 minutes – ready for company. We have a multilevel resort like pool with fountains right outside our door – we don’t have to clean it or maintain it. We don’t have to arrange for lawn care – or worry about a tree needing removed, or tons of new wood chips every year. We don’t have to worry about needing new windows are a roof leak, or a new heating system. It is easy to live here, there is not much to do. No unexpected cost of home maintenance. What I don’t like is it is boring – it’s not mine so I can’t rip down a wall or paint a wall, or replace the flooring. I can’t re-arrange the furniture because it barely fits where I put it to begin with. There is no room for new decor unless I purge something. Okay this could get really long. Bottom line I miss my home, but I wouldn’t buy 4,000 sq ft anymore – it is just me and my husband. But 2,000 sq ft would be just about perfect – which is twice as much as we have now. I would still like to have my own private backyard oasis, and a get-away space – office or a study/library. Hi, I am Katie and I live in a cookie-cutter garden home with 3 bedrooms 2 baths. I said I never would! I SWORE I never would! But, I totally do live in a garden home with my husband and our 1-year-old daughter. And, I have to say – bigger isn’t always better! Our first apartment was around 800-900 square feet (2 br/1 ba) and we now rent this “spacious” 1500 (?) square feet house. I think really and truthfully, the square footage doesn’t matter as much as the design matters. Our house now has considerably more space than our apartment did, but I am finding the layout to be less-than-desirable. For instance, the kitchen in our apartment was just a galley kitchen. Very little counterspace, very little cupboard space… but EVERYTHING we owned (kitchen-wise) fit neatly in that kitchen and was easy to access. The kitchen we have now is in a corner, so about 1/3 of our cabinet space is a deep pit of a corner and I am sure there are things in there that I will never use simply because they are too hard to access. We technically have more counter space, but the uninterrupted space (no oven/sink/etc) is in a corner… again… very annoying to use a corner space. The closet is the other main frustration – our master closet is a decent size walk-in, but our clothes fit better in our apartment closet. The apt. closet was a walk in, but it was also “galley style”. This closet has wire shelves everywhere and it’s just atrocious. ANYWAY. I have learned that I LOVE and prefer small spaces, but they’ve got to be designed for efficiency and to maximize space. The house we’re currently in does neither! We have 2200 sq. ft 5 bedrooms, 2 bath for 6 people (4 kids). I wouldn’t really want to go any bigger. I would, however, like the bathrooms and kitchen to be a little bigger. Well, our last house was almost 3000 square feet, and it was waaaay too much for our family of 5. We had a formal dining room and living room, a 4th bedroom/office downstairs, and a huge sunroom upstairs. The sunroom ended up being a storage area for toys and junk the boys didn’t have another place for. The “office” was so full of papers and junk that we basically threw out the whole room when we moved. The formal living room only ever held a couple of couches covered in laundry, and the christmas tree. Our current home (we are still renters) is just over 1500 square feet, and it is beginning to feel a bit tight. We have 3 boys, and the bigger they get, the more squished I’m feeling. We have been talking about buying in the next 5 years or so, and both feel that right around 2000 square feet will be our “sweet spot”. 4 bed / 3 bath, eat-in kitchen, lots of outdoor space. Ideally we’d love to move up to the foothills, but not sure how that will work out yet. Oh, and we want to go back to one level. I’m so sick of stairs! Though this house is better since the laundry room is on the second floor – just like all the laundry is! My house is 1518 square feet which sounded HUGE coming from an apartment. I’ve been pretty happy with this size. I would like the bedrooms to be a scootch bigger but I think much past 1700 square feet would just end up being more than I want to try handle. I do like the idea of a lot more space around the house. I think that is where I would love to do more. Gardens, a few citrus trees, more doggie run around space. Plus, I think it is so much nicer to have space between houses. I’ve never understood these gigantic houses they build and then make them 5 feet away from the other gigantic house. How is that different than an apartment? All the work of a big house and no privacy. I grew up in a house that was 2100 square feet and it always seemed like the perfect size. I guess you like what you get used to. Wow Ashley, you certainly hit on a hot topic! Seems we all have our own idea of the “right” size for a house. . . Lol! I love how you described your life with the boys and Adam, it sounds very much like how I grew up. I have never understood the need for the playroom, extra living room, etc. . . I agree that they just become messy and cluttered. As far as space goes, I really think we as Americans all have more stuff than is necessary (myself included) so we tend toward bigger spaces to hold it all. I live in a apartment with my cat, and right now I have a two bedroom two bath. I use the second bedroom as my craft room. I certainly could live in a one bed, one bath, but it is nice having the extra space. However, I only just got this space and had always had my craft area in my bedroom. The truth is, I would happily go back to less space and have my Mom back with me. It comes down to using your space well and sharing it with those you love. The home we are about to close on is a little over 1600 square feet, and so far, we think it will fit our needs as it’s our starter home. We did find a larger home at over 2300 square feet that we plan on purchasing in the future to be our forever home, but right now the 1600 square feet plus the 700+ space in the basement is perfect. It’s definitely more than the 450 s ft we’re coming from. I went from a 2500 sq. ft. house to a transition space of one room in my parents house (actually, the nursery my parents used for all three kids!) where I had to store all of my remaining items (I obviously purged when I moved). I stayed there for 6 months and saved to move into a 1000 sq. ft. house. Before the 2500, I had lived in a small house right after college and couldn’t wait to get into a bigger house. Now I am in a 1000 sq ft (smaller than the house after college) and think it is almost perfect. It does cause me to “organize” at least once a month – go through, get rid of the unnecessary items, and eliminate the piles that have accumulated of mail/borrowed and returned items/receipts/dog items. I find it so nice that I don’t live with all of the unnecessary fluff that I used to. I would like a workshop of some kind – currently we don’t use the garage for our cars, we use it for furniture being redone, our treadmill, freezer for meats bought in bulk, and overflow of household items I stock [dishwasher detergent, light bulbs, paper towels, toilet paper, etc. ), and our tools. It is so nice to become in tune with what your really NEED (even though yes, I know I have plenty of unnecessary items still). We have just under 1500 sqft right now with 2 adults, 2 kids and a dog. It had been fine for us until we found ourselves trying to make too many spaces work multiple duty, which is fine unless those duties need to happen at the same time. I think the key is UTILITY not footage. We were already using all of our bedrooms for family members so there is no separate room for an office, and I started working from home full time almost 2 years ago. We put me in the basement for a while, but that only works in the summer, during our 5 month winters we needed the basement for indoor play breaks from the cold. I was at the dining room table (our primary eating space) for a while but that is right in the middle of everything so nobody could be on the main floor when I worked. I’ve ended up in a 40″ by 40″ space in a dormer of our bedroom; probably all right for someone who needs a space on evenings but cramped for every day. I literally have a computer on top of our laundry hamper right now…. We have recently decided to relocate and up-function (yes this meant more square footage, more than triple it in fact). We bought a 4600 sqft home in the country. Sounds overkill but it delivered exactly what we needed, an eat in kitchen, a dining room that will get set up as a library and I will use as my office but welcome the kids to join me for homework hours, a rec room (kid space) separate from the living room (adult space), a room for my husband (man cave if you will), and an in-law suite for my father in law to join us. It seems like a huge amount of space even to me, but I know full well that no room will go unused. I’d like to start by saying I am currently a single person and I rent a townhouse and the “livable space” is 1020sq ft. For me, that works, though I am at the moment childless. I do need more room, and don’t think a townhouse would be what I buy in the near future. I don’t have a basement, but I have a garage with ZERO storage. So all of my holiday storage goes in a nook under the stairs, which is PACKED full of things. My misc. DIY projects are spewn across the garage along with my tools (EEK!!!!). Even as a single person (with a roommate) this is too little space for me to do everything I love most. My kitchen, although open, has very little cabinetry so I have major items in my connected dining space that double as pantry and storage. That leaves less room for a “dining space” and I cannot entertain and have trouble doing my projects there Would definitely not be able to have a family in this home though. Though, I wouldn’t need a whole lot of usable space. A basement would be ideal (with storage!! ), a larger bathroom (or a full and half bath with a family) and a larger dining or more useful kitchen space. The upside to my townhouse, is that I’m on the end with all of the greenery. It’s on a hill though, so it can’t be used for certain things, but is still nice! Our house is 2200 sq ft to me it is just right, 3 bd, 2 bath, 3 car garage, a 2car shop and a small barn. We also have 5 acres. The only thing about having acreage is somebody has to mow it. During the summer here in Texas that is every week. 4 hours on a riding mower if both of us are mowing. So be careful what you wish for. Our house is around 1400 Square feet, and we have several rooms we barely use (guest room, bar/den area, and a finished walk up attic). The only thing I would like is a 2nd bath, or at least a half bath. I think we have room to add one eventually, which would be great. Honestly, aside from that extra bathroom, I don’t want or need any more space. I have a hard enough time keeping it clean as it is! HI Ashley! Our home is close to 5000 sqft, 6 bedrooms, 6.5 baths. There are 6 of us living here (me, my husband and 4 teens/preteens) but when we bought the house we had 7 people living here. Each kid has their own bedroom AND own bathroom–they have no idea how fortunate they are–just wait until they go to college! We bought this house 4 years ago. At the time, we had 30 days to find a house in a small city, a strict budget, and we really needed 6 bedrooms or a basement where we could build 1 or 2 bedrooms. This house was the only one on the market at that time with enough bedrooms AND in our budget. We jumped on it. I’m very happy here but I have to say that this home has some of the dumbest use of space!! The kitchen is tiny (huh? ), there is no mudroom, the 2 car garage is really small so all of our bikes, lawn stuff, and sports gear is crammed into a tiny space. I put cubbies near the front door so the 4 kids have space to put their shoes, coats, backpacks, etc but its basically out in the open. We do have a laundry room but its the size of a closet (just large enough for the washer and dryer). Rooms that we really don’t use are: living room (because we already have a family room on the same floor) and finished loft space. Our master bedroom, closet and bathroom are so ridiculously large we could reduce it by 1/2 and still have a very large space. The good news is that our mortgage is affordable so hopefully we will be here for a long time. When we decided to retire we took the bold move to move to central Mexico and to build a home there. Counting the covered verandas and the interior patio we had 4300 sq ‘. One living area, 2 bedrooms, library, kitchen, pantry/laundry/dish cupboards, 2 1/2 baths on a terraced lot overlooking a large lake and an extinct volcano. It rnever froze or got above 80. Custom everything. Close to perfect except for the 5 month rainy season. Cancer forced a return to US. Now we have about 1600 sq ‘ patio home. Not perfect but we use every part of our house daily. My only wishes for the house are hardwood floors (doable) asnd a larger kitchen with a gas stove(not doable). I am okay with that because we are blooming where we are. I always laugh when I am watching House Hunters and they say, “We are having our second child so we are going to need at least 3000-4000 sq feet.” We have 9 children and our house is 1840 square feet (plus a 1/2 basement with some finish work started). We built the house ourselves and I drew the floor plan. We had 5 kids when we moved in. I understand most people would call it small but it doesn’t feel small to me. I keep reinventing the same space to function more and more efficiently. I have added many built-ins over the years (doing the carpentry myself). None of our rooms are huge but I think they are all big enough for what they need. We live in the North so we spend a lot of time indoors, too. The one thing I miss is just having big open areas to spread out, open spaces for kids to run around (they do it anyway, hopping over whatever is in the way). I stumbled across those books after we built but was very much on her wavelength without even having read them first. I love her concept. Another common thought these days is that every child needs their own room. I had 7 siblings and I never even wanted my own room. I enjoyed sharing a room. When I was 17, a couple siblings had moved out and I had the option of my own room, I passed it on to my younger sister and chose to share another room with two other sisters. Our current house has 5 bedrooms and 2.5 baths. Did I mention 6 of my kids are girls? Our bathrooms are just big enough for the components to fit in them. Bathroom time is limited to business. No bringing a book in the bathroom. And we have a separate space outside of the bathroom for doing hair. I’ve thought about starting a blog, now I don’t even have to! I just summed up all I have to offer in one post. 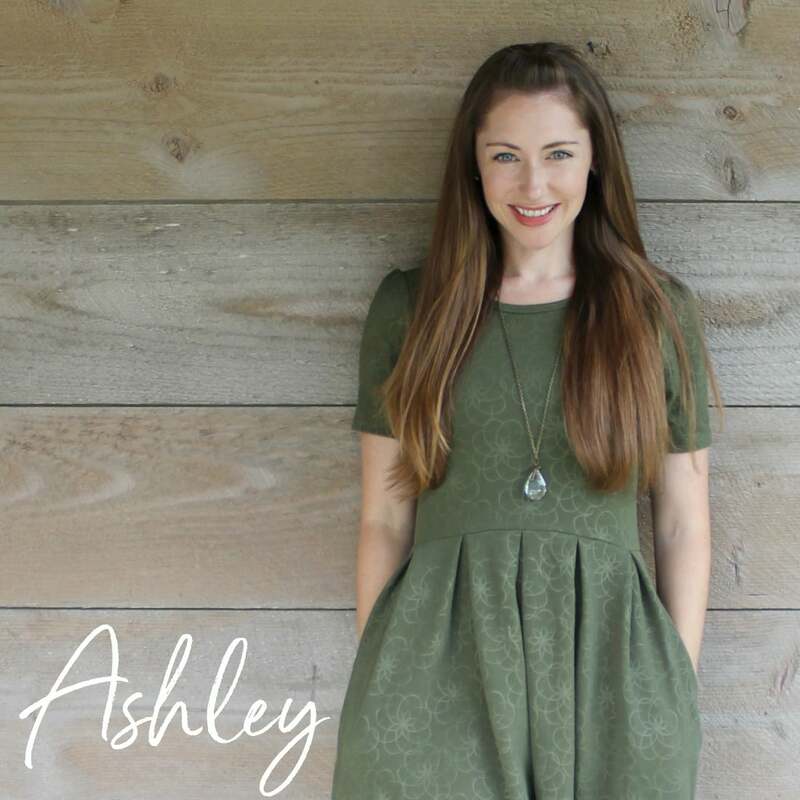 I love your blog, Ashley. I love your practicality and your humor and how you keep it real. We lived in two 1000 sq. ft. home for 21 years while we raised our two children. We finished the basement in our second home during that time, but I always thought it was too small. Now, there is just two of us, and we live in a 2000 sq. ft. home that I think is too large. I think it would have been too large for four of us. I also think that the more room I have, the more things I want to fill it – not a goof thing. It also takes so much time to clean. I love to clean but have mercy! I think around 1500-1600 sounds great as long as the layout is well-planned. Good question! Fun to read the comments. Our home is 1170 sq ft. (2 bedrooms up and 1 down) which we purchased for $80,000. 15 yrs. ago. The only thing I really don’t care for is that my kitchen is square which I find rather hard to work in. It has a foyer instead of a hallway that leads to the other rooms. The L.R. is huge and so is the master B.R. I find that the larger the room, the harder it is to decorate. We have totally renovated this house as well – moved walls to open it up more, moved windows etc. Our basement has a complete suite in it with a beautiful kitchen and full bathroom. Trouble is we really don’t use it because we’ve never had access to it cause our kids took turns living down there! lol! But they’re all gone now so we have to start utilizing it (other than the wine-making that goes on in the kitchen!) The house and yard sit on 2 city lots with a garage. I loved our first home (different city) which was only 990 sq. ft (also had a basement finished) where our 2 kids grew up. We were in a cul-de-sac and had a HUGE pie shaped lot! Miss it a lot. Having a big house is over-rated. I see so much wasted space in the new ones and it all counts as sq. footage. If a smaller house is well planned – storage is key – you really don’t need these big spaces. Mostly big houses cost more all around. And then there’s the cleaning! You can make a house a home no matter what the size and that’s what counts! I live in a 1000 square foot condo, and space-wise it’s fine since it’s just me living in it. There are 2 bedrooms, 2 bathrooms, a laundry/utility room, a living room, and a kitchen. What more could one girl need? I’ll tell you – A GARAGE. I’m dying to have one for the storage space, and also so I can have tools. There are so many projects I would love to do and skills I would love to learn, but without the work space I’m very limited. My next home will definitely be a single family home for that reason and it will have some room to grow into, but it won’t be more space than I need. No reason to pay to heat and cool a bunch of unused space! I live in 950 sq ft 2 bed, 1 bath with 2 toddler boys, the hubs and 1 dog, 1 cat. Overall the space isn’t bad, one more toilet would be ideal. This was suppose to be our starter home and than the real estate market dropped so we are waiting until we can break even with the sale. Our yard is a perfect size and helps in the warmer months to stretch out but living in the northern states makes winter a little unbearable. We also talk about our next house and the wish list would include, 1200+ sq ft with a basement and garage with a yard comparable to ours now and defiantly 2 bathrooms. I agree with your hubs that smaller homes keep the love in. The layout of a home I think is what makes or breaks the deal of it works well for a family or is more work for the family. I love this topic and your post. Mine’s 1076.40 I had to convert it from metres coz I live in Australia! Mine is tiny compared to most Aussie homes. Built in 1958 is a fibro cement 2 bedroom, ridiculously stupid layout home. The bathroom might as well be a cupboard. The laundry is in the kitchen, and the kitchen might well suit a caravan but not a home! Tiny blasted little sink and a rotten lack of bench and storage space is a nightmare! My previous home was 1200 and though not much bigger had a far better layout and made use of the rooms being placed in a better way. It was built in 1987. In the early 1960’s people didn’t live the way we do now, no computers, or tv so the rooms were for different purposes. Bedrooms were for sleeping and we didn’t own a million different clothes so no need for larger cupboards. How women lived back then and were able to cook in a lack of light kitchen always amazes me. No wonder they shelled peas outside, to see! Hence I am putting in much larger windows and re doing up the bathroom and kitchen/laundry. Time to live within the restraints but in a different way. Love your house, Ashley, great use of space! Our first house was 1100 sq feet before kids. It was a great size for us. It fit us plus 2 large dogs in Tx. Then we moved to Ohio and doubled our family and our square footage. And it’s entirely too big! Ideally, we need / want about 1600 sq ft and 1-2 acres. My husband, 3 children and one dog have lived in 2400 and down sized to 1176 feet. There is definitely a lot to be said for living within your means! Ihave experienced both sides of this debate: a separate bedroom for all the kids, a finished basement, formal dining room, compared to our boys sharing a room, one family living area and some of noise restrictions that Ashley mentioned. Our house actually used to be our rental property, so before moving in, we spent time bring plumbing, electric and the kitchen up to date, but within a very strict budget. We continue to customize with built in storage for what is necessary. This means less stuff, but more time for each other. Does my high school student dislike sharing with his younger brother? Sure. Will it matter five years from now? Probably not. The main advantage is less money spent on basic living and more left over for whatever we consider special. I’ve lived in a lot of different sized houses over the years. When I was a kid, the house we lived in was 3000 sq ft, which doesn’t sound that big until you have to maintain it….shovel snow, re-stain the deck, mow the lawn, clean three bathrooms and two living rooms…ick. As a teenager, me and my mom rented a place that was about 800 sq ft, but it had a huge yard that it shared with the other cottages on the property, and a barn (garage) with a loft (storage). When I first moved out on my own, me and my BFF rented a place that was mayyyybe 700 sq ft on a good day, but it had a big deck, and we were young and working and gone all the time, what did we care? Less to clean, less room to acquire things we didn’t need, and it was right in the middle of the city. The place I’m in now is just a little less than 1000 sq ft and I love it because it’s laid out well and every room has a closet. Including the hall. SO MUCH CLOSETS, STORAGE EVERYWHERE. I think a small space can *feel* big if it has a good layout. Conversely, the BFF and her hubby have 2000 sq ft and HATE IT. The house’s location and lot size is great (which, ok, those are important because they’re impossible to change), and the price was right, but the layout is horrible. She’s pretty much going to rip it back to studs when she has the opportunity (with 2 toddlers, somewhere around the 12th of Never). We live in a 2100 Sq Ft home and our last home was a little larger — 2350 Sq Ft. It’s not a huge difference but the layout is totally different — and there are only 2 bathrooms instead of 3 in the last home. With one less bathroom, more “living” space instead of bedrooms and a little less square footage I feel like it will be easier to keep clean. Both of these homes have ample storage though which with a husband who’s not so crazy about purging, this is pretty important to me. Our last house was 1375 sq. ft. with 2 bedrooms and 1 bath. But the living room, dining room, and kitchen were huge, plus we had a heated/AC’d sunroom with French doors where I could curl up and read away from the hubs watching TV. Plus we had a full basement. When we relocated a year and a half ago, we decided we needed 3 bedrooms and 2 full baths, so our current house is smaller at 1274 sq. ft., but there are more rooms (we also have a large mudroom off the kitchen, which is AWESOME). I work full-time from home (commercial interior design), so a second bedroom is a must so I can have a separate office where I can close the door. 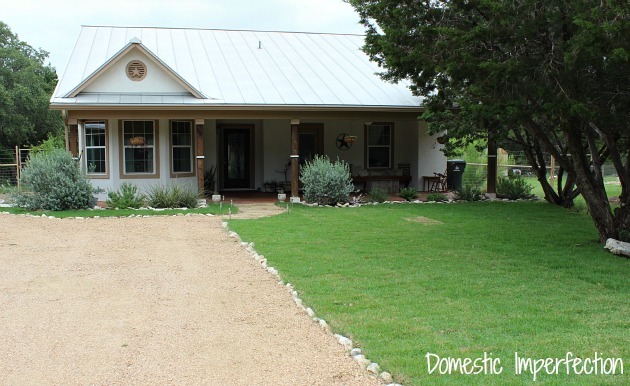 We loved this house because it has almost 3 acres, over 2 of which are fenced pasture, plus it has a huge barn with a loft, and a garage big enough to actually park in. While we love the property we have now, we actually liked the other house better. The third bedroom is less of a guest room and more of a dumping ground, and the closet in the master is small, so all of my clothes are in the guest room (but then it kinda feels like my own dressing room! ), so we really don’t need the third bedroom. It’s just me and my husband and our 2 beagles (plus the chickens and sheep), so small works perfectly for us. I wouldn’t want to clean anything bigger than what we have now! The first house my husband and I bought was 1860 sq. ft, 3 bd 2 1/2 bath with a second living room and a den and it was beautiful. I seriously loved that home and we were planning on living there as long as we lived in that state. Then we relocated and ended up renting a town home that is a little under 1000 sq. ft and has 2 bed and 1 1/2 bath. I realized that even though I loved our other home we only used like half of it. The two extra bedrooms and living room never got used. Even when we had our daughter we still pretty much used the same space just with baby toys added in. Living in this town home is pretty much like living in our old home but now I have less space that I have to clean! :) I completely sympathize with the noise issues of a small home, when our daughter goes to bed at night we are constantly checking the noise level so I think having a space like a garage or barn with living space added on top is an excellent idea! I was disappointed in Susan Susanks’s books when I first found them. Yes, the homes were beautiful but I had been looking for designs to build a new home. I had been raising my two boys in just over 800 sq ft which was plenty large enough for us. once my boys grew up and left home I downsized to 450 sq ft but that was too large for just me. Now I live happily in 300 sq ft studio apartment. for me it’s always been more about the outdoor spaces available than the size of the house. I grew up in a huge house that some of the foundation and original structure dated back to before the 1900’s. Five legit bedrooms, six fireplaces, a parlor, living room, formal dining, huge kitchen, breakfast nook, sun room, laundry room, and two full baths with clawfoot tubs. Full basement (not livable), a walk up attic, three storey barn and mutiple empty outbuildings, and an outhouse. The doctor who built it had eight children, and his in-laws that lived there with him. We were a four person family. I will never complain about the amount of privacy that kind of space affords. I will complain that it was hell to clean and up keep was non-stop, extremely inconvinent if you wanted to yell to someone in the next room, and you never heard people knocking on the door. Despite the awesome amount of storage space, and we were only four people…we filled that house up to the brim. It bothered me. BTW – love the “Not-so-Big” series. I love your post! I will also be on the lookout for those books. I just got around to posting on the subject regarding our new house… for those nay sayers on our house size it actually fits us well, and even when we have a child we have an extra unused room! Your blog is supreme to mine for sure though, I love your pictures. I still haven’t got my house clean enough to take pictures LOL. 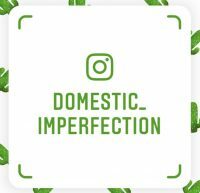 Your blog should truly be named domesticperfection. 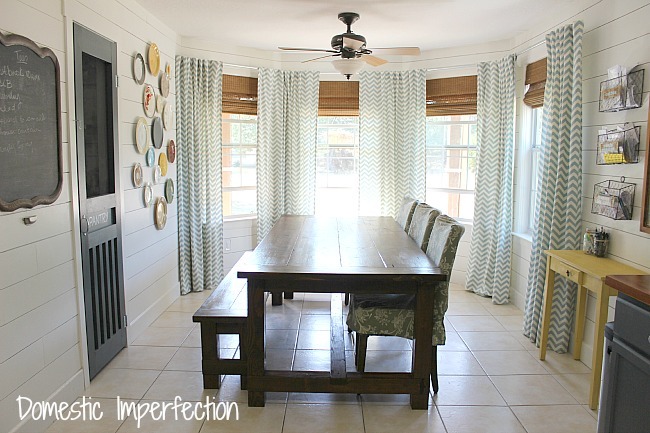 Your house is always super clean, and your DIY projects pretty much always turn out amazing! With our house the one thing I’m considering changing is turning it into a four bedroom. We have a huge “family” room, or living area and we only use 1/2 of it. I would prefer it closed off for looks and I’m sure it would become more functional that way, then we could also have an entry room or area. Two years ago we moved from our 1,500 sq ft starter house to our 2,000 sq ft forever house (on 129 acres… aside, having a large property is amazing… the most wonderful lifestyle). In imagining my forever house, I always envisioned two stories, so I had plans to put a big addition on this house. Now that we’ve lived here for two years, I realize what a waste having all of that space would be. We use every single room of our house every single day. I still dream of a massive kitchen, but it would also have to come with a live-in maid to keep it all clean! We will probably add on someday to get a garage, mudroom and my dream master with ensuite and walk-in closet, but it will be a much more modest reno, and we will still use every single space in this house. Let me tell ya…owning land is a lot more work than owning a big house! We got a great deal on a very 70s 2400sf house that sits on 3 acres outside of Waco. Back to land…we have 3 acres with a dozen pecan trees and fruit trees (I tried my first fig from those trees) and a tank. It is such a wonderful little piece of Texas paradise! On to why it is more work…mowing. There is SO much mowing! Thankfully it is positioned in a way that it looks like a grassy field beside our house when not mowed (our neighbors house is smackdab in the middle of their 3 acres and they can’t get away with not mowing!) but with a riding mower it takes days to complete. Have to keep it mowed to cut down on the wonderful vermin that could make their homes in it. We finally had to save up for a zero-turn mower that cuts the time down to a few hours (and makes the husband feel like a little kid with a new toy). The wonderful trees are also a lot of maintenance because of the awful Texas winds constantly knocking down branches/trees of all sizes. Half of our pear tree and part of a larger tree are down in our backyard right now while we’ve been waiting for the cold weather to go away so we can chop them up. Our tank is a very sad story because it dried up that few years ago we had that horrible heat wave and with all the fish gone, it just fills up with algae. My husband keeps throwing money at it because he wants to get it swimable some day (I see an expensive water pump in our future). And if your property isn’t fenced in that will be another chunk of change (but it does raise your property value when it is done!) We are currently working with neighbors to figure out a fencing strategy. This is a great post, and I LOVE reading through the comments. I live in North Texas, home of the McMansions and live in a shockingly small 1700 sq foot house. I say shockingly, because most people I know live in BIG (over 2800) houses. Mine is a midcentury ranch, on about 1/2 an acre back yard, and it’s just me and two Labradors. My first home here was 2500 sq feet and that was insane. It was just me, cost a fortune to cool in the summer and was just too much house. Somedays, I wish my home was organized better, but let’s face it- I don’t even use all of the space I have today! Great post, Ashley! i like the way you approach things. It’s fun to read all the comments. We live in a 1475 sq ft house and it’s just fine for us. We are with the four of us. We live in the Netherlands, so I had to convert from square metres. Houses are way smaller here, the average is a little under 1300 sq ft. In a crowded country as ours, we just don’t have the opportunity to have big houses. Although there are differenties beween the west of our country, which is way more crowded than the rest of our country. This house fits us just fine. We have 4 bedrooms, 1 is in our liveable attic en functions as our office/guestroom. Having a guestroom is not as common over here as it is in the US. We have 1 bathroom. Having 1 bathroom is normal over here. Most of the houses are 2 or 3 stories and besides the bathroom there’s a toilet downstairs. You can’t even call it a half bath, just a tiny little space with a toilet and a small sink in it. We do have a laundry room (which is also our mudroom and pantry), but that is also not common over here. Most people have their washer in the batroom, the attic of the kitchen. I’m very happy with my laundryroom/mudroom/pantry, although it is a little small. We have one big space downstairs, which has the dining room and livingroom. It flows into the kitchen. That’s the only thing I really disclike in this house, the kitchen is so tiny. Sometimes it drives me mad. If there are two people in the kitchen, there’s just no way to move around. That’s on the wishlist for our next house: a bigger kitchen. No plans for moving, but a girl can dream, right?? I love your small house. My big house is 980 square feet and we love it. In fact, most of my friends have houses that my house would fit inside about 3-4 times and they all love coming to my house. I think because it’s cozy and warm and reflects my husband and I.
Hi Ashley. I really appreciate this post. I don’t think people spend enough time thinking about what they really need, house-size wise. My husband, two sons and I live in a house that is 1000 sq ft with 2 bedrooms and 1 bath. I suppose our house is a small house, but it seems just fine to me. It is pretty well laid out with a larger living room and very small bedrooms so we spend almost all of our time together in the living area. It also has an open kitchen so the person cooking can be a part of whatever is going on in the living room. I’m a full time student working on a PhD, and last year my husband built me a small office in our backyard. It is 4.5 ft wide and 8 ft long and it is PERFECT for me. I can find peace and quiet to write and I have a space to keep my computer, printer and books set up. I love our house. It feels spacious and comfy to me and it is easy to clean and very cheap to live in (we spend less than $150/month on all utilities combined). I know some friends who have upgraded to bigger houses as they’ve had kids, but we don’t plan to. If we moved, I might look for a house with a second bathroom (because sharing a bathroom with 3 boys/men can get old), but that’s the only think I would change. I think it is good for the boys to share a room and with the money we save not living in a bigger house, we can put friends/family up in a hotel for a few nights when they come to visit (If they aren’t up for a blow-up mattress in the living room). Our house is about 1200 sq ft (with a finished basement, not included in that sq footage) We have an almost 3 year old son and another little guy on the way due in July. Our home is only 2 bedrooms so our boys will share a room. By todays standards our home is small, but I love it. My husband is a contractor and remodeled almost the whole house. At times it feels tight, and we know if we have more children it’s going to get even tighter. But, we have looked at other homes and they are either out of our price range or just not what we want in a home. You can’t beat our taxes or monthly bills either. We know in this home we can live comfortably and not be house poor. Plus I was able to leave my job to stay home with our son. For us, me being at home raising our children is more important than have a big home with lots of bills!! We’re trying to be as content as can be in our 1100sqf with a family of 5. I agree with your downsides… it’s tough. Our house is 60+ years old with very little character… so everytime I spend a dime, I think… why am I doing this? It’s just such a waste of resources )-: We don’t know if we’ll stay or sell… it too was supposed to be a ‘starter’ home but we put so much money down and we’ll not ever get that back. Oh well. So we’re staying put for now. I’d like more land, more space in our bedrooms and one bonus room. My husband wants a studio, garage, and storage space. When buying a home, I’d advise couples to think WAY into the future…. Just b/c you have one kid and you say your done, doesn’t mean that is how you will be in 5 years :0) My home has so many memeories, that I think it would also be hard to leave it…. I would love some more space though! I think that 2400sf is close to good. We tore down and built our place in 2007 and got totally sucked into the bigger, bigger, bigger trend in our neighborhood. Our initial goal was 2600sf. Somehow the plans came back from our architect at 3600sf and we ended up adding another 210sf by re-jiggering the guest room, and capturing dead spaces in the gables over our front and screen porches. We call them “mouse houses” in our girls rooms. They have 5′ & 6′ ceilings and 3′ high arched entrances (hence the mouse house moniker). The girls (4 & 7 y/o) love them! The little spaces are great for sleepovers!!! BUT, we would NEVER build that big of a house again…ever! 3800sf is ridiculous all the way around (I.e. heating/cooling/cleaning/furnishing etc). There is a whole 180sf room at the top of the stairs that is a complete waste of space. It’s the catchall room. I have a cleaning lady at home every other week. Oh, how I wish that bill didn’t exist. Though I tried for the first 6mos to clean it myself. It felt like I was cleaning all the time and it was never clean because I only had time to do part one day, part another, etc over three days to get through the whole house. It sucked. So now we pay our cleaner. Man, I miss our original 1543sf house that I could clean in 2hrs! Though its 2bed/1bath arrangement would never work four family of 4 and frequent guests. It’s all give & take, I suppose. I’m also working on my house like a madwoman! It is amazing how different it is from when we bought it but I still have a long ways to go! Umm, you misread the data. Your house is average size. That data you linked to is the median for NEW single family houses, built in the year specified in the column on the far left. Only brand spanking new houses have a median square footage of 2,400. The median square footage for all single family homes is about 1,800 square feet. Considering that almost 40% of housing units U.S. wide are in multi-family buildings (median sq. ft. of 1,000), the average living space of an American is likely about 100-200 square feet less than yours. As for your question, my 2000 sq. ft. house is sufficiently large, although I would not mind bigger. Architectural details, which it does have, are of greater importance though. My partner and I live in the Seattle area and our house is about 1900 square feet on a private lot just under 1/4 acre. I would not want any more land. Even 1/4 acre is a lot to take care of! The house is a 2 story, 4 bedrooms, 2 1/2 baths, 2 car garage with an unfinished partial basement. One of the bedrooms was converted into a loft and looks out over the vaulted living room. We have a master suite with walk in closet and double sinks which is really nice. Since it is just the two of us and our dog, we have 2 guest rooms and have company often, In addition to the vaulted living room, the house has a 2 story foyer, a craftsman style staircase, small dining room, laundry room. 1/2 bath and an eat in kitchen open to a family room in the back with a large deck, The deck could easily fit 25 people and it needs work There are lots of windows and 2 skylights upstairs. The house gets a lot of light and sits along a greenbelt, which we love; living in the Pacific Northwest. We have no neighbors on one side or in the back. At about 1900 square feet, we can easily entertain 20 people inside, on the first floor. However, it is a lot of work to keep clean! If you and family happy in your space, i am happy for you. My home is 3680’sqft under air..over 5000 total. I love love my home. I love being able to party with friends and family. I grew up in a small space with a total of 10 people in this small space. Oh my god! I feel so free now. I can breathe. I *love* this post. Truly. We moved our family of 8 from 1100 square feet to 2100 square feet PLUS a basement that is around 1100 of usable space. I really like having a basement this time (laundry room and family closet space is pretty awesome when you are expecting your 8th child…although I’d REALLY like my washer and drier in my kitchen, honestly). I also like that hubby and I have a master bathroom, which we didn’t have before. And the kitchen is FABULOUS, because it’s large enough for my kids and I to cook in together (it’s about 400 sq feet, as opposed to the tiny galley kitchen we had in the old house). All that being said, as soon as we’re done fixing it up and have saved a bit more, I want to sell. I want to pay cash for a smaller home (I’m thinking bigger than the old one so we can have kitchen space and maybe some storage like a basement), but smaller than this one (1600 sq feet sounds PERFECT to me). It will be easier to clean, the utilities will be more affordable, and we’ll be able to afford acreage. (Of course, our long term dream is to move overseas as missionaries, so maybe that will be next instead!). We had spent $$ at the old house to build a HUGE covered porch, and I miss that like crazy, too. So I’d love that in our next home, if we haven’t moved overseas by then, too.